Tiny rooms bring big problems! Thrift store mid-century nightstand with original wooden drawer pull, as I found it. I’d been looking for awhile. See, we live in a smaller house than we’ve ever lived in before, with tinier rooms, tinier closets, tinier storage… You get the idea. Which brings us to our bedroom. It’s, well, tiny. And we have a king-sized bed. So the room is basically “bed”. Our ordinary nightstands, bought for much larger rooms, won’t fit. So I’ve been on the hunt for small nightstands that are just the right look, feel and price. I’ve been looking for a few years now. The criteria: small, mid-century, paintable and cheap. We live in a mid-century house, so I have this new appreciation for appropriately timed pieces. So I saw this little guy. I wish there were two but I’m glad I found one at all. It was $5 and just needed a scrubbing and a paint job and voila! I used paint I already had, so no extra cost there. I decided to keep the drawer unpainted as a nod to its original state. I feel like its honoring it somehow; my husband says that look is now distinctly “mine”, where you paint most of a piece but leave a part of it “original”. I guess that’s me. Before and after of a $5 mid century nightstand. Painted and drawer lining applied. I added some shelf paper I also had lying around just for a little zing. I think it turned out cute. Just what we needed. On to the next cheap piece made fabulous! It’s pretty rare that I find a piece of furniture that I like in my price range that doesn’t need some kind of attention, whether it be a thorough cleaning, tightening of screws, paint job, Windex or something. In order to decide which direction I will take on its upgrade, I use my graphic design chops. My most recent case in point: this door-less Empire style tiger oak buffet. It’s got amazing bones and the original bevel mirror, and all of its drawers are in tact and accounted for. But how do I make it look fabulous with no doors below and old, unsightly wood exposed? I just started playing with colors on it, and the jury is still out on what to do with it, but I have some ideas now. It appears as though someone tried to give it another stain/poly job and it didn’t do it any favors. So we’ll see. I don’t want to have to paint the whole thing but this poor thing has been through so much, I just don’t know if she has another life exposed in her. I found a few examples of buffets like this that were painted. I’m weighing all options. I’ve been dying to get my hands on a chandelier with potential so I could redo it for a pretty, pretty princess. Enter Goldie here. I picked her up at a garage sale over the weekend and immediately started cleaning her up. She wasn’t in horrible shape, she really just needed a warm, soapy water wipe-down. I loved her shape and I loved all of the bling. The crystals (plastic, by the way) all came off and got cleaned, and so did the light cup/fake candle combo. The glass dome got hand washed and set aside while the frame got detailed and painted. The fun part, of course, is the painting, so I got busy on this beautiful day, and painted all day, starting with the underside. In the sunlight, it almost looks white, but it’s actually a flat lavender color from Valspar. The end result is a little big magical. I can only imagine the fabulous room this beauty will end up in. I’m a little bit jealous already. On to the next one! On my recent lazy, meandering, antiquing trip to Lexington, Missouri, I came across this beautiful little German mini spice cabinet. It was found in a little store on the outskirts of town and trust me when I say there was NOTHING interesting in the store but this. (Think vintage furniture, the ugly stuff.) I was ready to leave until the store employee showed me two more rooms to the store than I had realized. It was in the last room that I came across this little nugget of fabulousness. The price was steep; I had some work to do. After some casual chatting with the store’s only employee, I decided to make an offer. Beings as how I know nothing about cabinets like these, I was really guessing at what I thought was “fair”. After some fourth-party (me to employee to wife on phone to husband working in the yard) dickering over the phone, we settled on a price and I hit the road with my new treasure. The 45-minute drive home was longer than usual, as I couldn’t wait to sit down in my office and do some research on it. 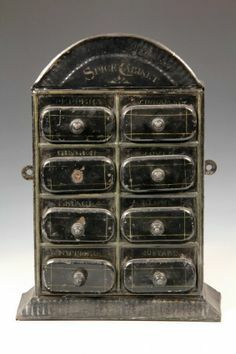 Here’s what I know: these little spice cabinets used to be a thing. When? Well, that’s where I’m fuzzy. Similar cabinets claim to date from as early as the late 1800s, but I just can’t verify that for mine. They’re also called baking cabinets I believe. Whereas they were popular, they are again. Decorators love epothecary cabinets, and anything else with a thousand little drawers. I know this because they’re hell to find in the rough. I saw an old metal card cabinet (like you would see in libraries growing up) at an estate sale this past weekend; it was gone within an hour, and it wasn’t cheap. This cabinet is made of wood, has one cabinet door with a porcelain vented tile in the middle. It was covered in a grease/dust mixture that equated to glue, but cleaned up nicely. Inside the cabinet is a shelf, which looks to be original. There are six drawers: Paprika, Gewurz, Pfeffer, Zimt, Kumel and Nelken. They are white porcelain with black lettering, black frilly scrolls on the sides and a pretty little image in the middle of each of the silhouette of a woman with a parasol. It includes just the right touch of blue to make the whole piece sing. I did find a lot of fabulous antique cabinets in my research though that I fell in love with. Aside from mine, I think I like the metal ones best. I snatched this little beauty up in a rural flea market on the drive from Mulberry, Florida to Miami. I loved the legs and thought it surely had more to offer than roached out wood and dust. It had a beautiful shape and the original glass and door pulls, so I knew I could do something with it. At the time, we were living in a hotel a stone’s throw from Coral Gables. With space at a premium, I cleaned it up and used it immediately. Once we were settled in our Coral Gables apartment, I got to work on it, thanks to a mis-tinted can of paint from Home Depot ($5, thank-you-very-much). I couldn’t have been more pleased with how it turned out. The color was close enough to Tiffany Blue that it really elevated it. I gave it a little class by painting the window jams white. Painting the inside white was a no-brainer, because it served to lighten up the entire piece, making it look clean, intentional, stylish. I hated to see it go at one of our garage sales once we moved to Missouri, but it just didn’t fit with our current decor. So when someone expressed interest in it, I waved a long good-bye to this pretty little thing and carried on. Nothing Chair Has Glamorous Past! This poor chair has been with me since 1994, when my son was born and I was setting up my first, very own “home”. It was, undoubtedly something that my grandparents picked up years ago at an auction, as they were known to do that here in Clay County. Let’s see – this chair has moved with me no less than 10 times (let’s see: Pittsburg-Topeka-Creve Coeur-Overland-St. Charles-Virginia Beach-Virginia Beach-St. Charles-St. Peters-Miami-Liberty-Baltimore-Liberty) in that time. I never paid much attention to it. If it’s had a place in my home, it’s had a slip cover on it. It has always looked just as it does in this pictures: Blah. It was only recently that I checked the underside to find this label: Brent’s Homes furnished Complete 716-722 South Main St. Los Angeles, Calif. Naturally, I was curious. And guess what I found? Practically NOTHING! The only thing I could find was a reference in the Advertising Cyclopedia, using their catchy “Homes Furnished Complete” slogan as a teaching tool, and a 1922 Los Angeles Directory with their name included. Not one piece of furniture, not one ad. So here it is, world, the only surviving piece of Brent’s Furniture. And it has a weird splatter paint on it and nasty blue corduroy. There is another layer of fabric underneath the blue, and the deep maroon color holds some promise, with the understanding that the spatter paint goes and this is as gorgeous as I think it is underneath. I would guess it’s oak. We shall see. Another project just made the list. 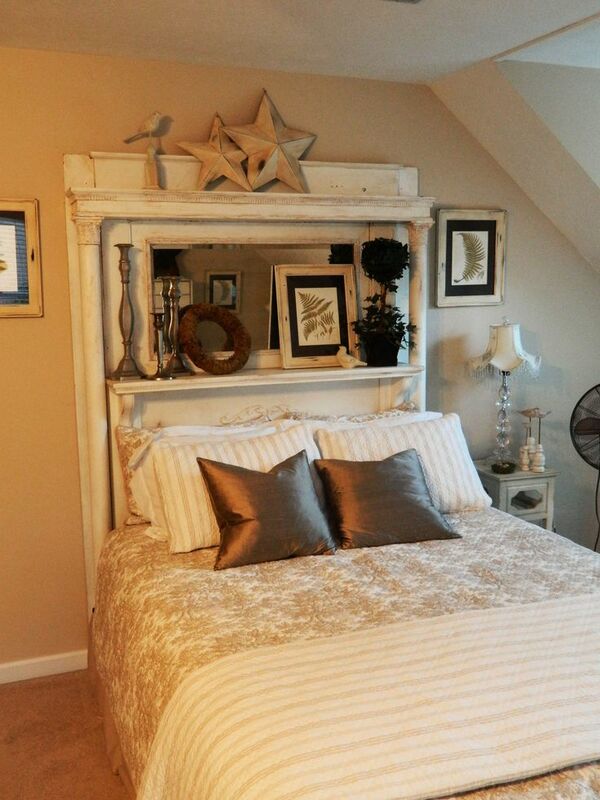 New, Old Antique Headboard Idea ALERT – Welcome to my newest obsession! 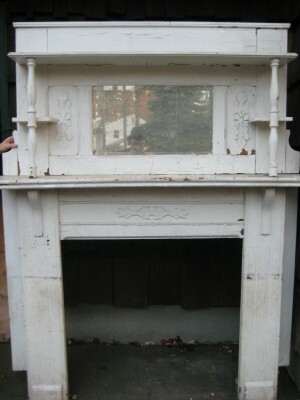 Am I late in realizing how AWESOME an antique fireplace mantel would look as a headboard? I mean, has this been a thing for awhile and I somehow missed it? Tonight I was kind of watching HGTV’s You Live in What? (3/3/13 original air date), a show that profiles unusual, usually repurposed, homes. On this particular episode, they featured a church, an old city incinerator and a silo in Southern Georgia. Nothing terribly exciting UNTIL they showed the master bed in the silo home. 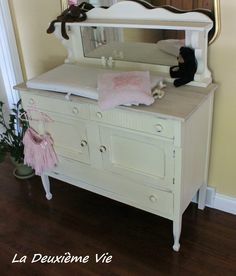 The bed was made from an old fireplace mantel and chair rail. I can’t believe I hadn’t thought of that before! 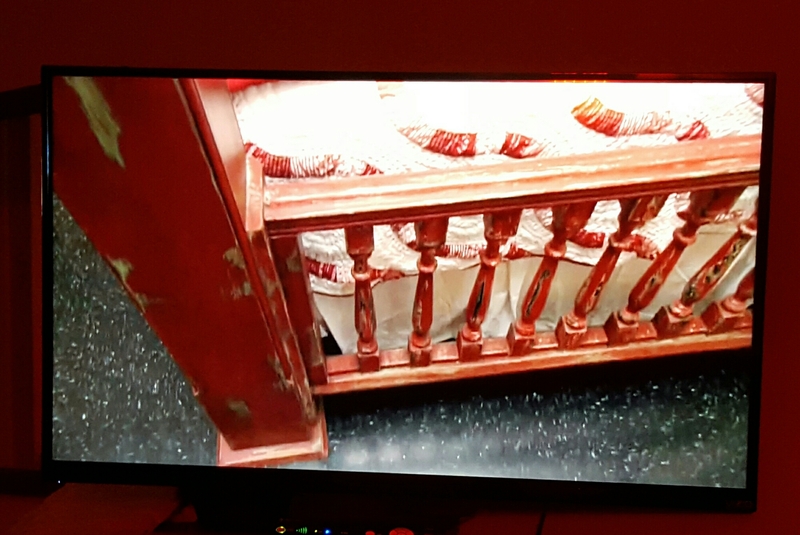 I’m not crazy with the red/rubbed/chair rail/distressed look they have on theirs, but I could DEFINITELY get into an old, untouched finish version. 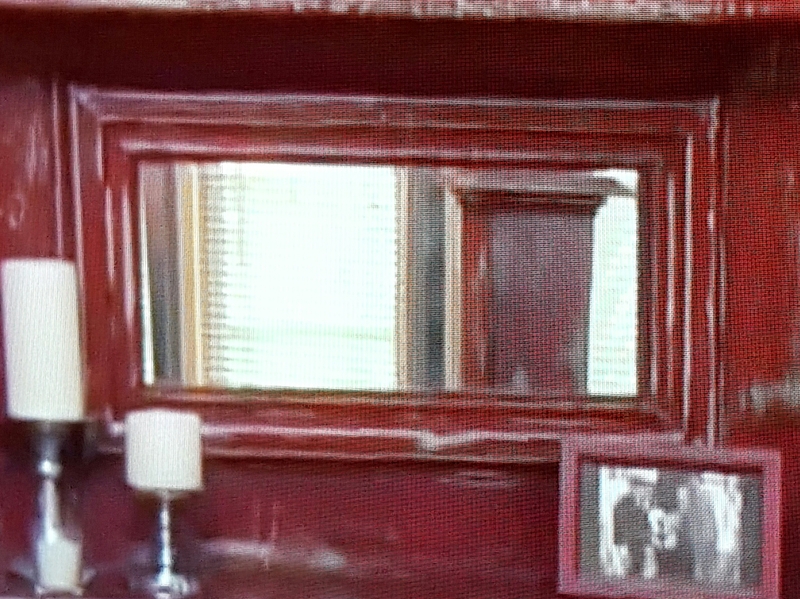 I love that there are two shelves on this one, I love the pillars holding the top one in place, and I love the mirror. At first glance, antique mantels don’t go cheap ($500-$10,000, so the only chance I have at actually having one of my very own is to give them a serious look when I come across them in my garage/estate/barn/thrift sales. I’m hoping I can get away with spending no more than $200. When I come across one, I’ll report back. Another one with pillars and mirror (I think I need that style, for real). Some are adding an upholstery panel to the bottom, which is a little more formal than I think would work for me. This one might actually work for a king-sized bed.